I started my Pinterest business so I could travel more. I love spending time in Europe, and I was so excited when I was finally able to quit my job and travel as much as I wanted! But travel is expensive. And since I still wanted to keep my home base in Pennsylvania (I have too many books to ever want to live completely out of a suitcase, and my family is here), and Europe is pricey – plus I had no desire to travel to ultra-cheap tropical locations and melt (I like 60F/15C days! ), I had to figure out another way. 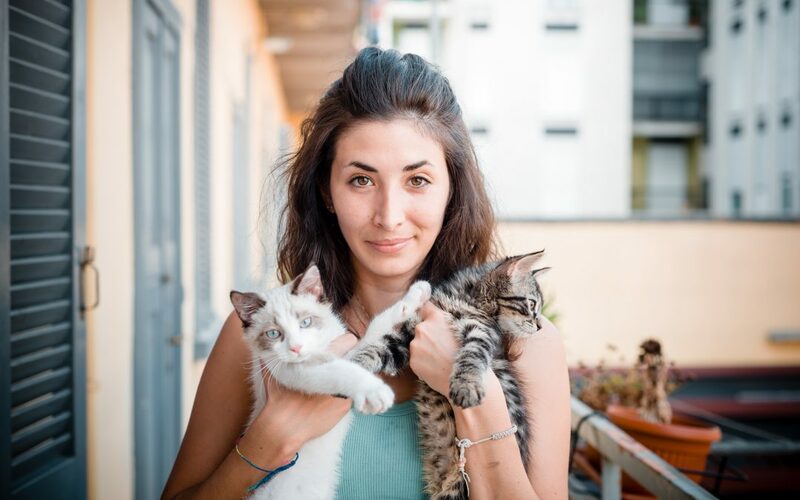 One of my clients travels the world full-time through house sitting, and recommended Trusted Housesitters. I love cats, but can’t have them in my rental home, so house sitting seemed like an amazing way to spend time with cats and see the world. You can sign up for Trusted Housesitters for 25% off by clicking my link or using my coupon code: RAF177753 – Affiliate notice: I only recommend companies and products I trust! I have a paid annual membership to Trusted Housesitters and will get 2 free months added to my account if you use my link. I browsed through some of the sits before signing up and was pleasantly surprised to find a lot of sits in the UK, my favorite place in the world! Given that the site was founded in the UK, the majority of sits are there, as well as other English-speaking countries like the US, Canada, and Australia. But there are a number of sits in other countries as well – from European countries like France and Germany to more exotic locations like Thailand and Dubai. I realized that even one short house sit a year could easily pay for my membership – I would make it back versus paying for 1-2 nights at a hotel. So I decided to sign up! The “trusted” part of the site’s name is vital, as verifications and reviews pay a key role in landing the house sits you want. I set up my profile with an indepth description of who I was, why I wanted to house sit, and my past experience (which was a little thin, only one time house/dog sitting for a friend of a friend). I completed the Basic and Standard verifications (you have to pay an extra fee for Enhanced, which includes a criminal background check, and it has never been available for me to get – possibly only for UK residents?) and asked my roommate and landlord to write a short recommendation. I added a few photos (you can also add a video if you want – I don’t currently have one) and I was ready to start applying to house sits! Since I didn’t have any reviews on the site yet, I started small – applying to short house sits (a week or less) based in the UK. I drafted a long application letter, explaining that I was new and showing genuine interest in caring for the pet(s) and exploring the area. Trusted Housesitters offers a number of options to help you search through available sits. You can filter based on the pets you prefer watching, the dates you are available, the length of sits, and more. They have a map option too if you’d like to visually see where the sits are located. They recently came out with apps for iPhone and Android, which have most of the functionally of the desktop site. The user interface is far superior to the other house sitting sites I’ve explored, with tools to make finding a house sit as easy as possible. One of my favorite parts of the site is that it gives you an idea of how many others have applied to a sit already, listing ranges of 0-3, 4-7, 8-11, 12-15, etc. Some sits get more than 40 applications! Others may only get one – and that could be yours! You will generally hear back about the house sits you apply for within a few days, though some people may take a week or more to get back to you! Rarely, you may not get a reply at all – this usually happens when tons of people apply to the same job (even if there were only a few when you first applied, go back and check if there are more). You’ll see “Reviewing Applications” when they’re still deciding, and “No Current Dates” if they picked someone already. Another benefit of Trusted Housesitters is that home owners have to pay for a subscription, just like you. That means the listings are more likely to be genuine and the owners more committed to a booked sit. Other sites will sometimes let home owners join for free – which could mean more house sit listings, but you’ll sometimes need to wait longer for responses and perhaps do some double checking before making travel plans. Flights and other transportation costs – you usually need to pay these! Will you need a car or can you get by with public transportation? How long can you leave the house? You don’t need to bring up all of these right away – just the ones that would make you turn down the sit if it’s offered. For me, I need good wifi and access to public transportation when house sitting in Europe. In general, I’ve found that messaging back and forth is all that is needed for shorter sits, while longer sits they usually would like you to jump on a video call. Always try to be as open and transparent as possible – they are considering whether to trust you with their house and pets! Once a home owner sounds interested in having me sit, I start to figure out if I can logistically make things work. Make sure you don’t agree to two house sits that overlap! Check travel times and other things you want to do around the house sit. Also, take some time to think things through – do you really want to house sit for this person, take care of these pets, and explore this area? Remember that you will be able to be more choosy about house sits after you get some reviews, but don’t take a house sit you have a bad feeling about. The home owner will formally offer the sit within Trusted Housesitters’ messaging system, and you will accept it there as well. But you DON’T have to accept it right away, and you can still send additional messages without accepting. If it’s going to be more than a day before I accept, I let them know why (usually just making sure it will work for my schedule – which could mean you’re waiting for another sit you’ve applied to to get back to as well). Don’t accept a sit unless you absolutely know you can make it work, aside from any unforeseen emergency coming up. The owner shouldn’t mind waiting a few days with it pending for you to make sure. And if you have accepted a sit and something does come up, let the owner know as soon as possible so they can find a new sitter in time. Congrats – you landed your first house sit! Now it’s time to book your travel! I always like to let the owner know when I book my flights/trains, etc. It will give them peace of mind that you are actually coming! Your sitter should provide a welcome guide that walks you through the basics of things within the house and about their pets. Here’s when you can ask all those non-essential questions – if the welcome guide doesn’t answer them for you! You’ll also want to check how often they want updates from you, and how to send them. Sometimes, they’ll even give you lots of tips about things to see and do in the area – plus the best restaurants, nearby grocery stores, and the best way to get around. Often, they’ll have a friend or neighbor listed in case you run into any problems during the sit. Sometimes they’ll welcome you with a meal the evening before the sit, especially if you’ll be staying in a guest bedroom for their last night in the house. They may even be willing to pick you up from the train station or airport! You’ll have a chance to meet the pets and be walked through their daily routine, and find out all of the little quirks of the house. Try to ask any additional questions while they are there at the house. I like to phrase things like, “How do you usually do” whatever you’re asking about. I like to try to keep things similar for their pets and house if possible, but don’t feel like you have do everything exactly the same! Usually you will have been able to get a sense of how particular people are from their listing. Some things do have to be kept to a strict schedule, especially if pets need medication or special diets. And then, enjoy the house sit! Make sure to take advantage of where you’re staying and explore the neighborhood and general area. But do spend a good amount of time with the animals, especially during the first few days as they get used to your presence. Keep the owners updated with any issues and general status reports (you did ask how often they wanted to hear from you, right?). Snap a quick photo or two of their pet(s) as well if they seem likely to miss them. I also like to mention anything they seemed to be worried about before they left (yes, I did put the bins out on Wednesday night for garbage collection!). Also, take advantage of the money-saving aspects of staying in a home. While you may want to go out and try the local cuisine occasionally, cooking at the house will save you a lot. You can also do laundry, and if you’re a digital nomad like me, get your work done with a steady wifi connection. Try to keep the place relatively tidy while you’re there (you never know when an issue may come up where you need outside help, and you don’t want their repairman or neighbor to see 2 weeks of dirty dishes piled up! ), and if you’re staying a week or more, be prepared to do a deep clean before you leave (if you’re very lucky – they may already have a regular cleaning service that comes by and you won’t have to worry about it!). I also like to throw my sheets and towels in the wash before I leave, to save them the trouble of washing them when they will already have a bunch of laundry from their trip. Make sure you know exactly when they are arriving back, so you can be completely ready to go when they arrive. They will likely want to just relax and enjoy being back at home, but they may offer to let you stay the following night, especially if they will be arriving late. Or they may be okay with you leaving before they arrive if you have somewhere you need to be. Past owners have even given me a ride to the train or bus station when I’m heading out, but don’t assume this. You will also want to figure in a little time for a final report and to answer any questions they may have about their pet and house. Once you’ve finished a house sit, you can request a review from the owners on Trusted Housesitters, and give them a review in return. Hopefully, if you’ve followed all my advice above, you’ll earn a 5-star review! Try to be gracious and informative with your reviews of the house sit. You are staying in someone’s home, not a pristine hotel. I would not rate someone less than 5 stars unless they misled you about aspects of their home and pets, or if there were serious cleanliness or safety issues with the home that they did nothing about when you brought it to their attention. I like to include helpful bits of information for future house sitters in my review as well – walking distance to town or a bus stop, etc. – that aren’t already in the listing but could help them make a decision about whether the sit is a good fit for them. I also thank the owners and include a bit about the pets in my review as well. And now that you’ve completed a successful house sit, you can start landing others! Just be careful to follow tourist visa rules as you start spending longer times abroad. As an American, I can spend 90 days in Australia, 90 days in Ireland, 90 days out of 180 days in the EU, and 180 days in the UK at a time, generally, on a tourist visa. While that does give me a lot of flexibility, I shouldn’t apply for a 4-month house sit in France. Also, if you are getting paid for house sitting, you will likely need a work visa. Many blogs about house sitting say you shouldn’t mention it during passport control, even if you are sitting for free, as some border officials will consider “accommodation as payment” and want you to have a work visa. I instead talk about my planned tourist activities and have a scheduled date of departure from their country or from Europe in general. As you accumulate more reviews, you’ll find it easier to land new house sits, and you’ll be able to be more choosy about the ones you apply to. But popular areas will still get dozens of qualified applications, so be sure to check the site frequently to get the gigs you want! Have you ever done house sitting before? I’d love to hear about your experiences! Also if you have any further questions for me about it, be sure to leave a comment below! 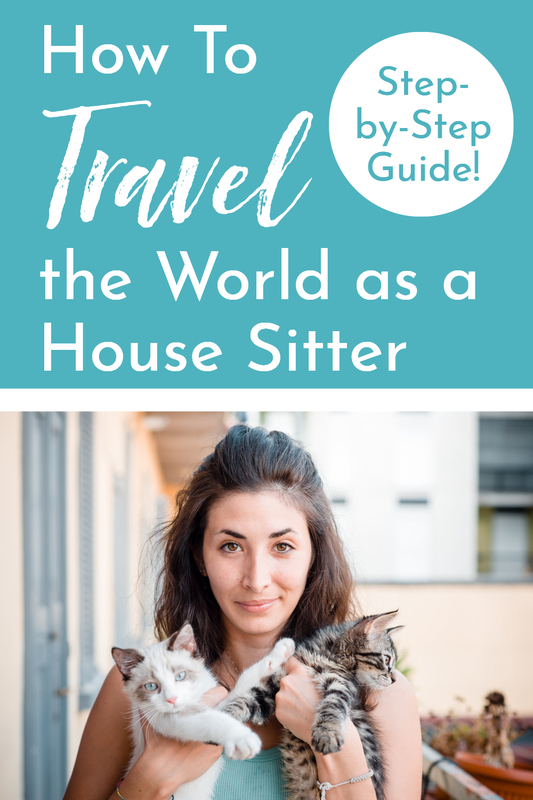 And don’t forget to sign up for Trusted Housesitters so you can start traveling the world! I should be on a plane right now. Heading back to Pennsylvania, ready to resume my 8-to-5 on Monday. Instead, I’m sipping tea at my lovely house sit in Oxford, waiting for my clothes to air dry (because dryers aren’t really thing in Europe), deciding what I want for dinner, and strategizing about how to grow my business. Location independence was a dream of mine for so long, but I always had this fear in the back of my head that it wouldn’t happen. I was smart, but not special. Creative, but lazy. Great with ideas, but not ambitious in the slightest. So I maxed out my two-week vacations with trips to Europe and NYC and Chicago, gradually started investing in better courses online from people who were living the life I wanted, and began hanging out in communities online with people who were starting businesses. But I still had no clients, and it felt like I would never have a successful business. Then 3 things changed. These are the 3 things that changed for me between “wishing” for location independence and it actually becoming a possibility! 1. I found a tribe. The Bucketlist Bombshells were all about having location independence, but not having to work for years and years to get to that point. Through their courses I rediscovered my love for design and learned the best way to start earning a steady income while traveling – an ongoing service-based business. 2. I found a niche. 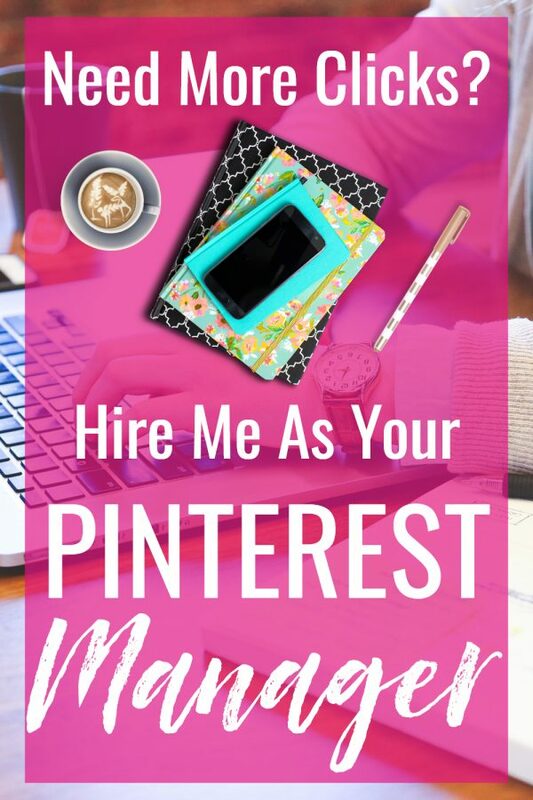 I was completely intrigued by the idea of being a Pinterest manager, but it seemed almost too good to be true. So I signed up for a course, and then a few others. We’re still bit of a newer thing, so Pinterest management often gets grouped with social media, even though it’s not very social. What I really loved about focusing on Pinterest was a) it used my design skills, b) I could do the work whenever I wanted due to scheduling aka complete time freedom, and c) it provided a tangible result for clients – more traffic to their websites. 3. I found a mentor/client. After a little success with Pinterest design, I knew I would need to have some ongoing management clients to bring in steady income. The problem was, while I knew so much about Pinterest from the courses I’d taken, I had no experience actually managing a Pinterest account for someone else! Enter Susi. I shared in her group promo thread an offer I was trying out – 50% off my services for 3 months – and she took me up on it! And she has shared about my work in her group several times, leading to additional clients. I’ve also gained so much from what she shares, from improving my mindset to making travel more affordable with house sitting! That’s it. Those are the 3 things that changed for me, between being a wannabe entrepreneur to the beginning of an actual business! How long did it take? I found my tribe in April 2017, and it took a bit before I bought their courses and started doing them. I first heard about Pinterest management in November 2017, and bought my first course in January 2018. I had my first Pinterest design client within a month, while I was still finishing up the course, and Susi became my first management client in March 2018. Want to know more about my journey? 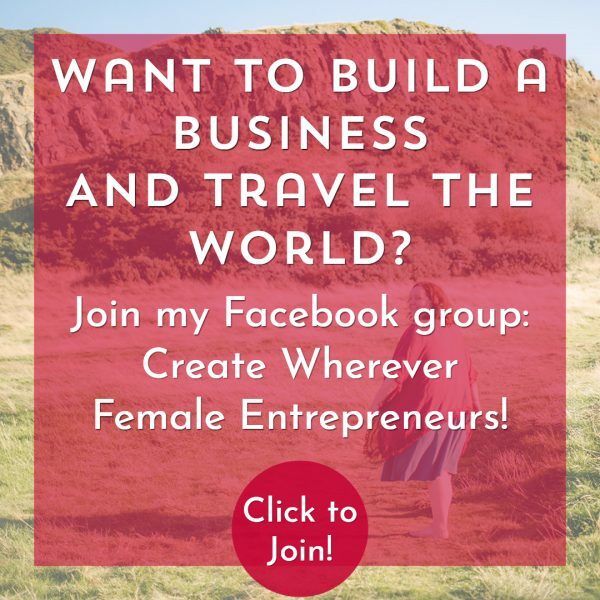 Join the Create Wherever Female Entrepreneur Facebook group! 1. Tell me a little about you! Hello, my name is Heather! I am 25 years old and live in Minneapolis, MN. A brief overview of me: I grew up figure skating, was a hockey cheerleader in college and I now perform part-time as a figure skater and singer and I work full time as a Digital Design Strategist. I am currently training for my first triathlon, travel as frequently as my bank account allows and watch the sunset as often as possible. 2. What were you doing before you decided to pursue starting your own business/location independence? 50% of my job was based on skill and being able to perform all day every day. (Side note, there are very few days off in show business. For this particular show, we had 0-2 days off a month). The other 50% was based on how good I looked in itty-bitty costumes under spotlights that showed no mercy. It bothered me that so much of my job was based on what I looked like when I had spent so many sleepless nights and anxiety-filled days working to earn a degree. Shows are not permanent and because of that, my income was inconsistent. I wanted something to bring in income all year round but still allowed me to pick up and go anytime I needed to leave for a show. When I returned from my third contract, I was determined to find a way to earn money between shows. I looked into anything and everything like whether or not I qualified for Uber, seasonal jobs that lasted only a month, etc. but I felt like these were all temporary solutions and I wanted something long-term. In the midst of my search for a solution,I came across a Bucketlist Bombshells ad for a course that taught women how to work online and be location independent. Bingo. A light from heaven may as well have been shining down on it; I had found my answer. I bought the course within minutes and I haven’t looked back since. 4. What are some of the first steps you took? Looking back, would you have done anything differently? I went through the courses and launched my business within 2 months. I started out on PeoplePerHour to build my confidence and once I had a few small jobs under my belt, I moved back home to North Dakota with the goal of landing bigger clients. This strategy worked like gold and I landed various jobs during my time there. Are there things I would have done differently? Yes and no. I learned so much from every poor decision I made, I feel like it was worth making them but I can think of two things I wish I had known before I started. Second, I was surprised by the amount of guilt I felt when I started. The image of my friends who work hard and HATE their job was like a movie reel that played over and over in my head. Each time I thought about how much I loved my job and how miserable they were, my guilt increased. I started working 12+ hours a day to cope with it and let me tell ya, that ain’t healthy. I started using a planner from a company called the Best Self Co. and it revolutionized the way I define a successful day. I stopped clocking my hours and focused only on getting 3 major tasks done each day. Once I completed them, I was able to enjoy the rest of my day. Between the planner and the book “The 4-Hour Work Week”, I have developed a much healthier working relationship. When you work for yourself, it’s very easy to become a workaholic if you don’t set boundaries. 5. Tell me about your business! What do you do, who do you do it for, and why do you love it? I could write a book on why I love what I do but I’ll try to keep it concise. From a selfish perspective, I love being able to plan my own schedule, take vacation days without asking permission, not be a slave to my alarm clock and have the freedom to work from anywhere. I’ve been able to go home for birthdays, attend graduations, travel for weddings, visit my parents for a month at a time and take a 3 month road trip. I am also in a long distance relationship and I was able to help my boyfriend move, attended his graduation and fly to watch some of his hockey games in person. Aside from the fact that I enjoy not being chained to one location, I genuinely love what I do. My friends joke that I’m the “mom” of the group because I’m constantly taking care of everyone. I feel like I’ve been able to put that to good use by doing what I do. A lot of clients I work with are very lost when they first contact me and I LOVE helping them grow their business or organization through their branding or website. My job is very fulfilling and I’m so grateful I live in a time that this lifestyle is possible. 6. 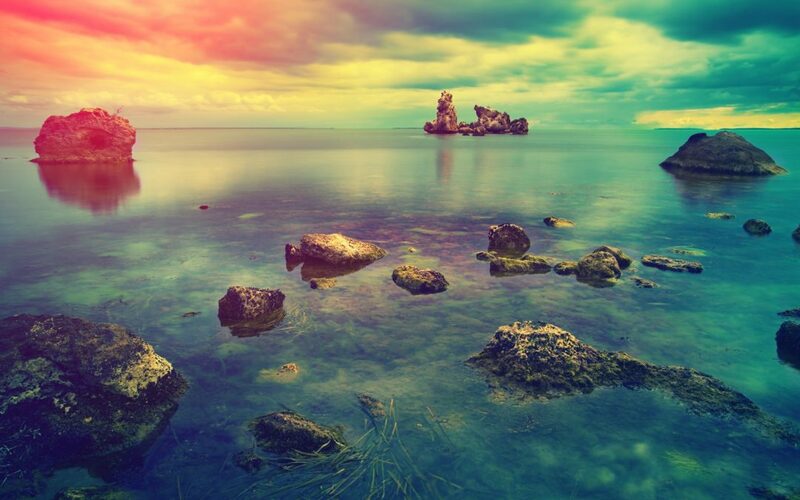 Where have you gone with your newfound location independence? This summer, I have trips planned to California, Alaska and Iceland. I have found that while I love traveling, I like having my home base to be around the people I love. 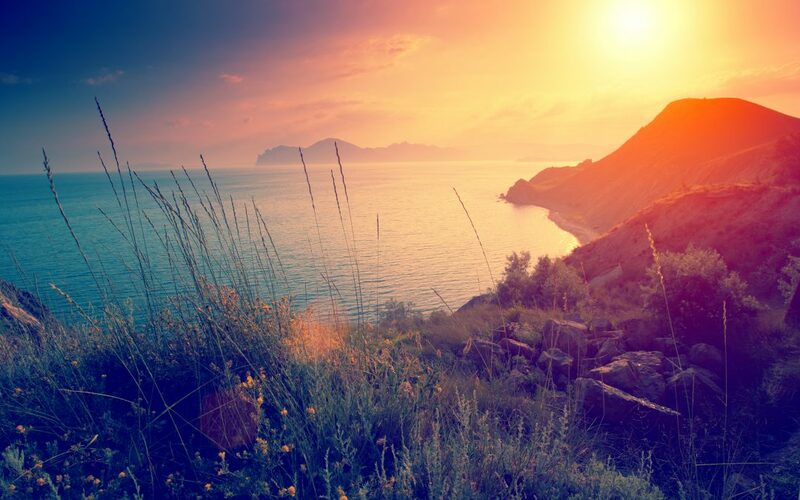 In the future, I would love to buy a place along Costa Brava, Spain, but for right now, I’m content with my life and the way it is now. 7. What is the most important lesson you’ve learned so far on this journey? ONE lesson? Oh my, this is asking a lot, but I’ll do my best! There’s no do-overs in life. You get the time your given here on earth and that’s it. You don’t have time to play it safe. I also want to point out that a lot of fears that hold us back are unfounded. Some businesses thrive on fear-based marketing. They make money by successfully planting “what if?” ideas in your mind (of scenarios that, let’s be honest, won’t happen) that convince you to buy a product or take an action. Just something to keep in mind when building a pros and cons list of a career change. 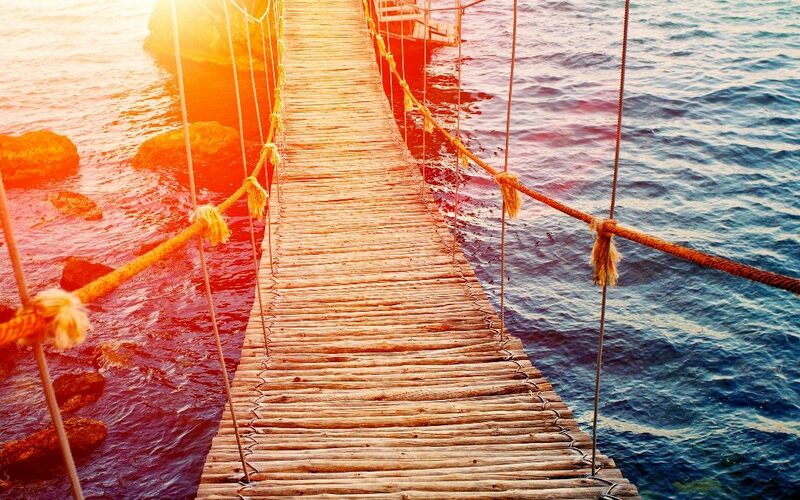 I want to add that taking a risk doesn’t mean you have to quit your job, sell your house and travel full time. A lot of people do that and love it, but maybe your dream is to start an online business so you can be a stay at home mom who spends her free time baking cookies and attending soccer games. If that’s your dream life, go for it! Don’t feel like you have to fit any kind of mold that isn’t you. I will say though, be sure to travel at least a little bit. It’s the best education you could ever give yourself! 8. How have others reacted to this new direction for your life? Very mixed but running off to join an ice show isn’t exactly the norm so I don’t think people were that surprised by it. I did get a few sassy comments like“it’s nice that you’re trying to start your own little business” but I just ignored them. Unless they were living a life that I wanted, I wasn’t interested in taking their advice. The people whose opinions I actually cared about were incredibly supportive and that is something I will forever be grateful for. 9. What people/resources have helped you the most? First, I wouldn’t be here if I hadn’t enrolled in the Bucketlist Bombshells course. It really did change my life and I’m so thankful I came across it. I also took a course called B-school which is rather expensive (not something I would take if you are just starting out) but has really been helping me refine my business. o Perfect for any creative, especially if you feel guilty for pursuing a life you love. o For me, it started a little slow but it has a crazy amount of practical tips and tools once you get into it. o Uggghhh NUMBERS! This is any creatives nemesis when it comes to running a business but that’s not an excuse to ignore them. Again, this starts a little slow but push through it! You will learn a ton if you do. 10. Do you have any final tips for other aspiring digital nomads? No one will ever give you permission to get started, you just have to do it. With that said, I would be wary about putting too much pressure on your business too early on. Starting a business is a lot of work and if you also have the pressure of paying your bills with it, it’s going to be stressful. My advice? If you’re working a full-time job that takes up most of your time, it will be difficult to build your business at the same time. Not impossible! Just hard. If you are serious about quitting your corporate job, here’s what I would do: job hunt for a part-time job that will pay the bills and be easy to quit. Once you find it, quit the corporate job and work part-time until you feel confident your business can support you. Many people have not followed this and have still built incredibly successful businesses though, so take this with a grain of salt and do what’s best for you! If you ever feel discouraged and want to quit, here’s my email: heatherbrockell@gmail.com. If you spend the time to reach out to me, I will return the favor and answer any questions you have for me. I can’t guarantee I will have all the answers, but maybe we can find a solution together. I have been blessed with an incredible support system in my life and I would love to return the favor and be that person to you if you need it. 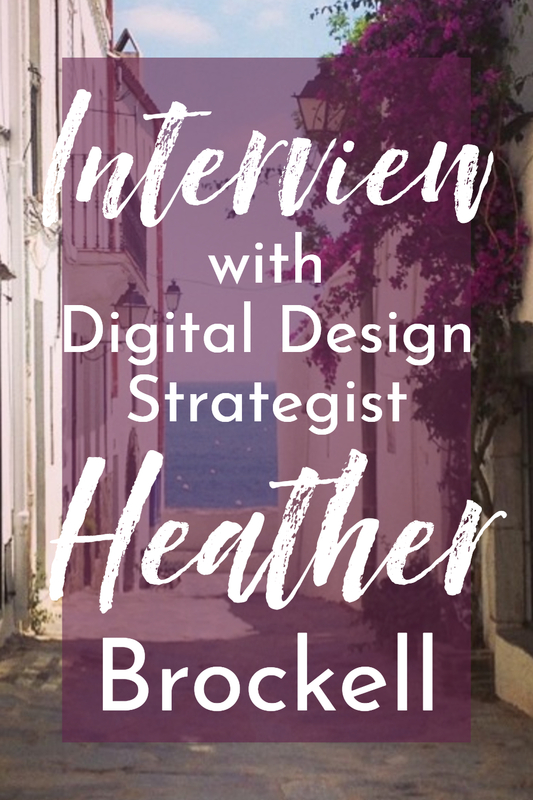 Thanks so much for this interview, Heather! 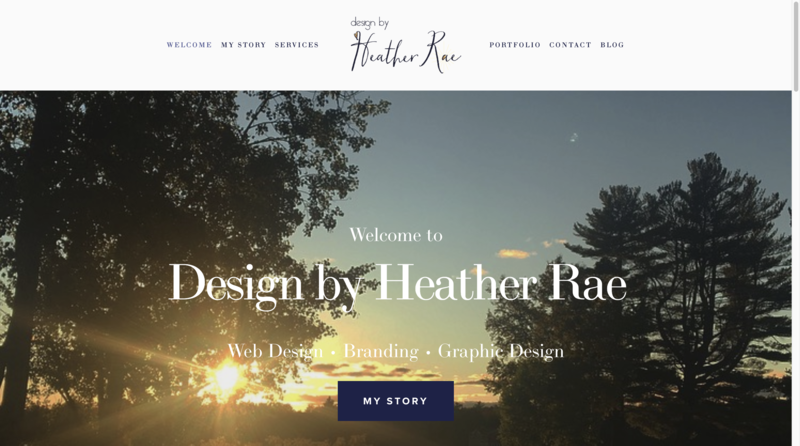 Be sure to stop by Heather’s site: Design by Heather Rae! This post contains affiliate links, which means I may get a small commission to fund my travels if you choose to purchase anything. I’m only an affiliate for products and services I’ve tried and loved, and will always be completely honest about any drawbacks or issues I find! Are you as addicted to quizzes as I am? Whether I’m figuring out which Disney princess I am (Belle, duh) or evaluating my business knowledge and preferences, I love finding out more about myself. I started with a video walk-through of Interact’s site, and I was immediately impressed. Not only is everything clean and professional, but they have so many integrations and options available for businesses and bloggers to use for lead generation. When you combine the viral possibilities of a great quiz with in-depth data gathering, it’s clear that Interact can be a game changer for marketing. And with clients like the World Wildlife Fund, The Home Depot, and Greenpeace, Interact plays in the big leagues. But small and medium-sized businesses are not forgotten. One of my favorite tech education sites, Skillcrush (a connection I discovered by happy accident), uses their platform to gain 10,000 subscribers annually, and Interact’s Lite Plan is robust and affordable enough for almost any solopreneur or start-up. Quizzes can be dead simple or extremely complex. Interact has a library of more than 100 pre-built quizzes in many niches that you can use as is, or customize to suit your business. I started out by choosing one of these templates and examining exactly how all the different parts worked together. The most popular type of quiz is the personality quiz, where choices/answers lead directly to specific result options, but they also offer assessment and scored quizzes. After a few minutes poking around the pre-built quiz, I felt confident that I could create a custom quiz on their platform! I started with a fairly simple concept for the quiz. As a Pinterest manager, I have potential clients wondering if hiring me is right for their business. And to be honest, many times it’s not the right step for a business to take just yet. If they have no way to convert the traffic Pinterest brings, have no content to promote, or have more time than money to invest in their business, it may be better for them to wait. But for businesses that are ready, this quiz would provide reassurance that a Pinterest manager can help grow their reach, and it would also educate them about some of facets of Pinterest management (design, scheduling, A/B testing). And like some of my inquiry forms, this quiz would give me information about where they stand, to be better prepared for client calls. Two vital techniques helped me create my quiz easily: 1. Start with the results, not the questions. 2. Draft your questions and the answers they relate to before you start building in Interact. I used Google Sheets to draft my quiz, putting the results along the top as columns and the questions along the side as rows. I learned from the demo and sample quiz that each answer can lead to more than one result, and multiple answers. So I repeated answers a few times in the columns when they would lead to more than one result, and fit two answers in one cell under one result if needed. You may want to grab a sheet of paper to draft if your quiz is threatening to get unwieldy in a spreadsheet. Interact recommends 5-10 questions for quizzes, with 7 being the sweet spot for people finishing quizzes and getting accurate results. I ended up with 8 for mine. Since I had everything ready, creating the quiz in Interact involved mostly cutting and pasting what I’d already written into the platform. I reworded and expanded things as I added them, and even added a few answer options. While drafting was very helpful for getting organized, it was a little tedious entering more than 30 different answers into the quiz – but I do believe that extra step created a more refined result in the end. As I get more familiar with Interact, I believe my drafts will be a little more rough/conceptual before I move them to Interact’s platform. Also, while my quiz is text-based, you can also use image answers! CC0 stock images from Pixabay are integrated right into the quiz builder, and you can upload your own images as well (there is 2MB limit per image, so you may need to resize first). I did include photos for the cover/intro of the quiz and each of my results, and I highly recommend you do the same, at a minimum. You can also add images to each of the questions. I added the results first, then put in the questions one at a time, with their answers. I clicked the “Edit Results Correlations” in each question/answer page to match up the answers to the results, which was super easy! I chose my brand colors and the Google font I use on my site to make the quiz look like it belonged. I also was able to add my logo/favicon, but I was a little disappointed at limited options related to the logo. I also added my photos at this point in the quiz creation. 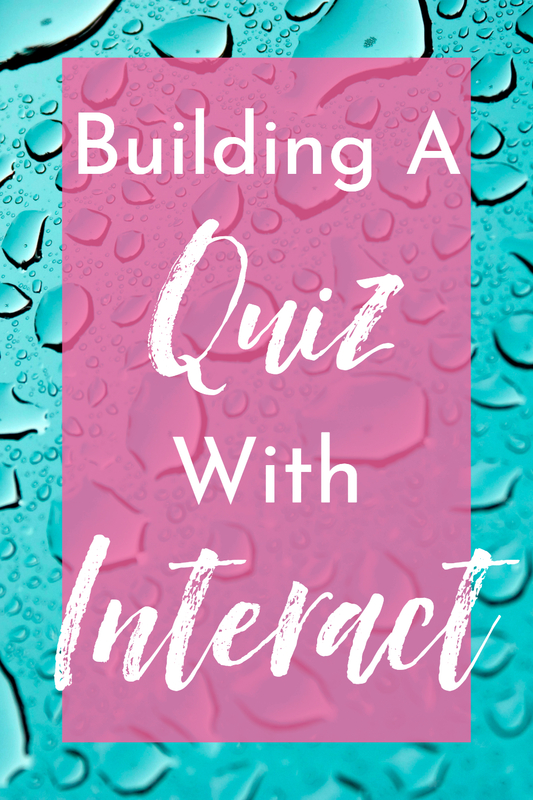 This was probably my least favorite part of setting up my quiz – but it’s mostly because Interact has so many possibilities and I wanted to do it right. Also, connecting to an email service is inherently a lot less fun than dreaming up a quiz! I really love that you have so many options with Interact’s platform – customizing calls to action for each result (which you can do when you create your result options, but I ended up going back and editing them at this point, once I had a clearer picture of where I wanted them to lead). You can force quiz takers to give their email address before they get their results, but Interact recommends that you offer a subtle “skip this step” option as well. 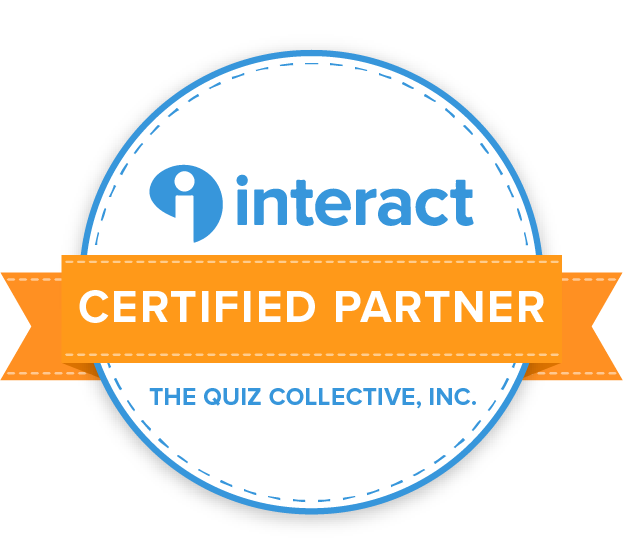 Interact offers a number of different ways to incorporate the quiz on your website, complete with a WordPress plugin. However, I had several issues with trying to set up an announcement bar for the quiz. First, the color picker was extremely buggy, and I had a hard time adding my color hex codes, as most times I clicked on the popup it would disappear. I also wondered why it hadn’t carried over my brand colors from the quiz. Sure, I might want to switch them around, but it would save a few steps. You can’t change anything but the colors and the text – no font, sizing, button shape/shadow, etc. options. You also can’t build more than one announcement bar option for each quiz. So with wanting to promote my quiz both here on Create Wherever and on my Quite Katie site, I was faced with a dilemma – which branding should I use for the announcement bar? The navy, light blue, and bright pink of Create Wherever would clash with the peach, teal, and burgundy of Quite Katie. But that was rendered moot by the next issue I faced. Interact’s announcement bar covers fixed headers. Instead of sitting nicely above all your content like hello/announcement bars are supposed to do, it clumsily overlaps your vital navigation. When my announcement bar didn’t look nice with either of the two options they offered for placement, I researched the issue, and all their help files had was “oh, your site must have a fixed header” – no options for solutions. I reached out to them regarding this, but haven’t heard back. Since my Quite Katie site has the navigation underneath the main header image on the home page, I was able to incorporated the bar properly on that page of the site only. I changed the branding to match that site, and it was good to go! But I still wanted to have the announcement bar integration here on Create Wherever. I tried searching for Interact and Divi (my site’s parent theme), but came up empty. I then began to look outside of Interact integrations and see how others had included hello bars with Divi. I found a fairly expensive plugin and a free Divi announcement bar generator. The generator had some styling issues (putting the button flush with the bottom of the bar instead of vertically centered) and it, but fortunately I know CSS and was able to fix the issues in the generated code. So far, my solution works, but I would love to see Interact bring their announcement bar up to the level of the rest of their service. Perhaps they assume that larger companies will already subscribe to a hello bar option? I’m super impressed with Interact so far, and it has great potential to help businesses grow! As I just created my first quiz with Interact, I don’t have results to share yet! Look out for an update to this post, or (more likely) a link to a follow-up post after I’ve used Interact for a few months! I do have one positive story already though – the day after I finished the quiz, a potential client was unsure if she needed a Pinterest manager. I sent her to this quiz, and her result was Yes! Her business could benefit from a Pinterest manager. We have a call scheduled next week! Try Interact out yourself, and I’d love to hear about your results with the platform! We all want to save a little money when it comes to our blogs and businesses! One way we can do that is by using free stock photos – they’re often beautiful, high quality, and cost us nothing. What’s the downside? The downside – everyone else has the same idea! So the best photos get used millions of times all over the internet. A friend of mine used a free stock photo for her ebook. Within a month, I had seen that same image on a Facebook ad, as the background to a quote on Pinterest, and as the feature image on two separate blog posts. “What’s the big deal?” you may be thinking. And true, it may not matter much if someone who stops by your site has a vague recollection that they saw that photo before. But it matters on Pinterest! Because there, people are not seeing one photo on a webpage by itself. They are seeing your free stock photo pin next to dozens of photos, often about very similar subjects. You chose your photo because it looked nice and matched what you were writing about – but how many people wrote about the same thing and used the same photo? One of my clients wanted 25 pins and Canva templates from me, and since I usually design in Photoshop and Stencil, I played around with Canva to get used to it. One of the designs I created was a simple travel blog post pin, using one of the free stock images I found in their library. That’s a lot of pink, right? Do you want to be competing with so many pins that use the exact same image that your pin does? Again – it’s not that free stock photos are bad. They’re much better than illegally using photos you find online with a search engine. It’s just that so many people are using them on Pinterest, it makes it hard for your pins to stand out if you use them. And the pins that stand out (in a good way!) are the ones that get more clicks and repins. And there are ways of using free photos that can work for Pinterest. I’ve used free stock photos myself. If you take a look at the older posts on this site, pretty much all of them use free images. But check out the pins at the bottom of each post – most have a color overlay with white text on top, both of which hide a lot of the image. 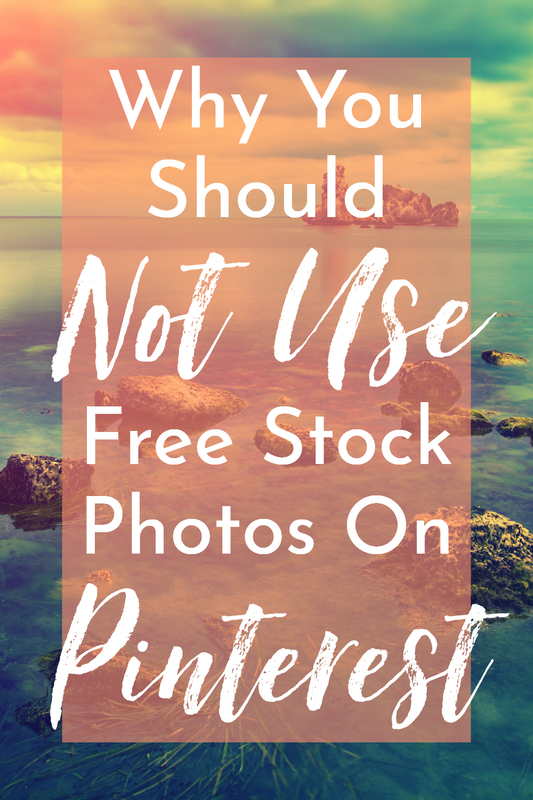 This is one way you can use free stock photos on Pinterest, but still have your pins look different from others that use the same pin. But from now on, I plan to use purchased images to make my pins stand out. DepositPhotos *affiliate link – I use this site for a lot of my key art, including the Create Wherever header image! You can buy downloads, or get a monthly subscription. The best offers usually give you images for around $1 each. IvoryMix *affiliate link – Gorgeous flatlays, with plenty of whitespace for text. You can get a subscription (like I did!) to get access to the full library and monthly new items, or purchase individual photo packs. There’s even a scene creator if you want to use your own backgrounds! 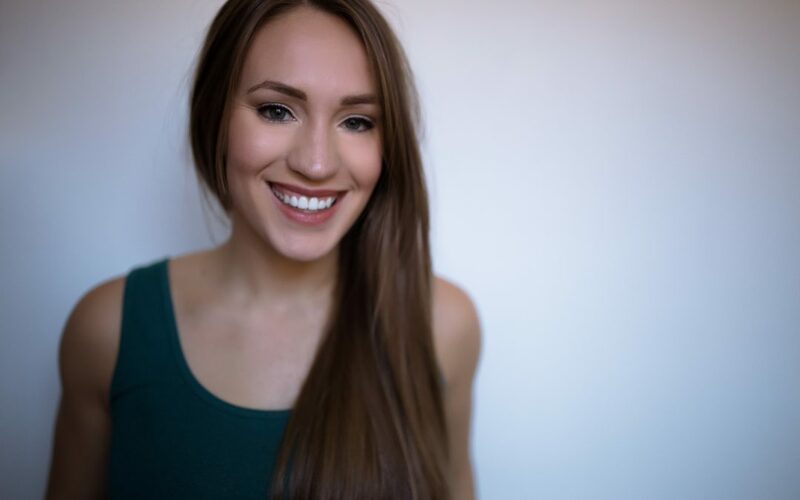 Kayla does offer free stock images as well, and since IvoryMix is not as well known as sites like Pexels, if you really can’t pay a few dollars for unique images, start with her free ones if they fit your brand! StoryBlocks (formerly GraphicStock) – I love that I can buy a one-year subscription to this site and download any photos as I need them! 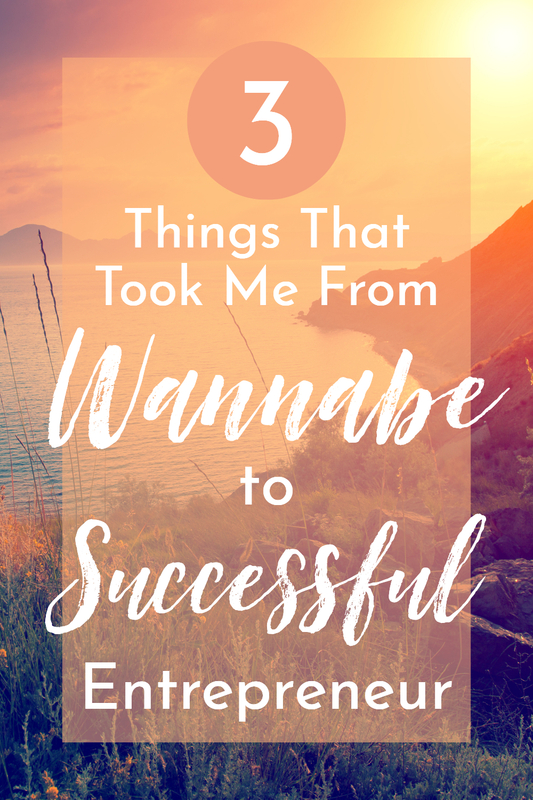 It makes a great choice for blog post graphics and pins, like the ones I’m using for this post! They did just add a Marketplace option with additional photos you can buy a la carte (with a discount if you have the subscription), so if you only need a few that can be a great option. DealJumbo *affiliate link – This site is famous for its bundles! They sell not just stock photos, but fonts, mockups, and other design elements. It’s great when you are looking to have a collection of similar images to create a streamlined, branded look for your pins. What are some of your favorite sources for stock photos?